Rocketmine is celebrating the fabulous women in their organisation and recognising the great steps they are taking to break through the male dominated aviation industry. “Women’s Month and International Women’s Day on the 9th of August is the perfect time to highlight the great work and positive impact the women in our company are having, not only in our organisation, but within the industries we work in,” says Chris Clark, Rocketmine MD. As a Remotely Piloted Aircraft Systems (RPAS) Service Provider and registered RPAS Operators Certificate (ROC) holder, Rocketmine falls within the aviation industry. This industry has been long known to be male dominated with figures suggesting only 3% of pilots internationally are female (Read more here). The gender inequality has not gone unnoticed with a number of programs and initiatives to encourage more women in the aviation sector. The South African Civil Aviation Authority (SACAA), under the leadership of Mrs. Poppy Khoza, are taking the task of transforming the aviation industry very seriously with the launch of the first-ever Global Aviation Gender Summit. The summit will bring together nearly 500 representatives of government and the aviation industry from across the world to jointly chart a new flight-path that will bring about meaningful gender transformation and equality in aviation (Read more here). Another initiative is the Women and Aviation organisation who are dedicated to informing, connecting, motivating and inspiring the current and next generation of Science, Technology, Engineering and Mathematics (STEM) leaders in Africa with a focus on aviation and space through various strategic programmes. The Girl Fly Programme Africa (GFPA) Foundation is an information and skills development STEM educations programme for school learners who are interested in the aviation and space industry. The programme exposes young women to a world of opportunities and highlights the achievement of women within these industries (Read more here). The 2018 GFPA Camp took place in July and Rocketmine participated in the career expo day, educating the girls about the drone industry and how to become a drone pilot. 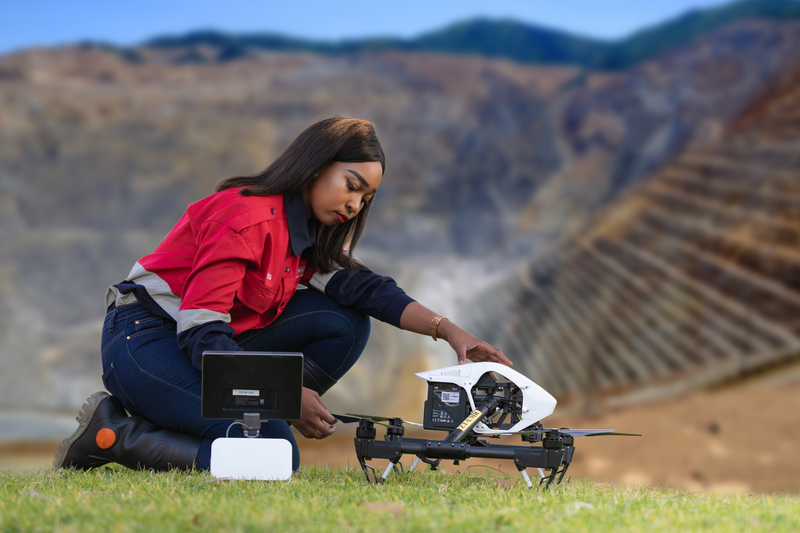 Looking specifically at the RPAS industry withinSouth Africa, the SACAA confirmed to Rocketmine that as of July 2018 there were 778 registered RPAS Pilots with just less than 8% being female. This is an improvement on the aviation industry as a whole but still demonstrates a major gender gap. This percentage will increase slightly after this month thanks to an initiative taken by UAV Industries to launch a free Remote Pilot Licence (RPL) Training Course in Cape Town exclusively for women. Only 5% of all their RPL students have been female and they are committed to improving this ratio (Read more here). Rocketmine has encouraged females to join their company and within their South African team females make up 20% of their RPAS pilots. “We will continue to encourage equality and believe that aviation has nothing to do with gender but rather ability, passion and commitment,” emphasises Chris Clark, Rocketmine MD. “We are not only proud of our female RPAS pilots but also the other strong females within our company that are contributing to making Rocketmine the success it is”.